It’s been 12 months since our first glasslandic party, and in that time, S&S senses have been pulled more and more towards capabilities outside of standard band to band showcases. Building on ideas explored last July, we’ve mapped out a true night of sound and vision. Performances from favorites Pressed And, Noah Wall, Megafortress, Gem Club, and RxRy will be set to motion by the fused imagination of videographers BriAnna Oslon and Nathaniel Whitcomb. 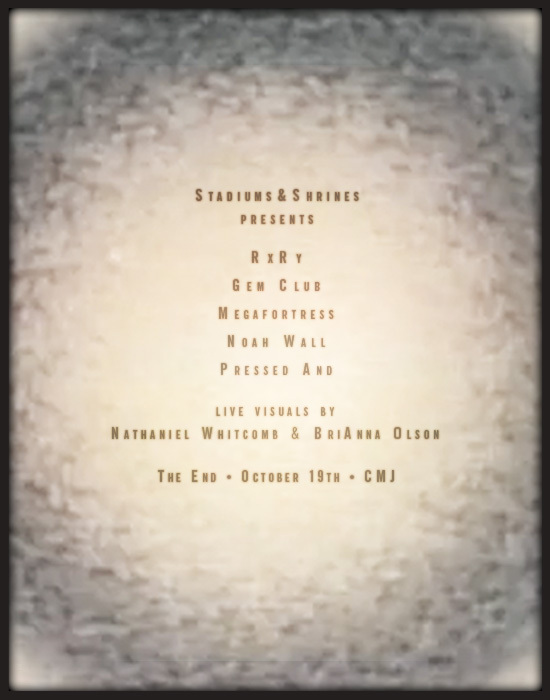 It’s happening October 19th, at a multi-use creative facility in Brooklyn (13 Greenpoint Ave) known as The End. Hope to see you there—details at FB.